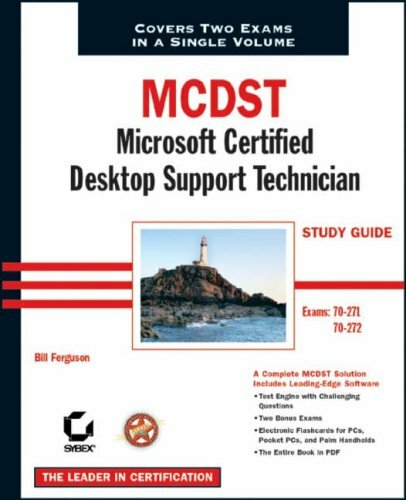 Helps you to prepare for Microsoft's MCDST exams-70-271: Supporting Users and Troubleshooting a Microsoft XP Operating System, and 70-272: Supporting Users and Troubleshooting Desktop Applications on a Microsoft Windows XP Operating System. Here's the book you need to prepare for Microsoft's new MCDST exams-70-271: Supporting Users and Troubleshooting a Microsoft XP Operating System, and 70-272: Supporting Users and Troubleshooting Desktop Applications on a Microsoft Windows XP Operating System. This two-in-one Study Guide was developed to meet the exacting requirements of today's certification candidates. In addition to the consistent and accessible instructional approach that earned Sybex the 'Best Study Guide' designation in the 2003 CertCities Readers Choice Awards, this book provides: in-depth coverage of all exam topics; practical information on supporting users and troubleshooting applications; hundreds of challenging review questions; and, leading-edge exam preparation software, including a test engine and electronic flashcards.This book offers authoritative coverage of all exam objectives, including Exam 70-271: Installing a Windows Desktop Operating System; Managing and Troubleshooting Access to Resources; Configuring and Troubleshooting Hardware Devices and Drivers; Configuring and Troubleshooting the Desktop and User Environments; and, Troubleshooting Network Protocols and Services, and Exam 70-272: Configuring and Troubleshooting Applications; Resolving Issues Related to Usability; Resolving Issues Related to Application Customization; Configuring and Troubleshooting Connectivity for Applications; and, Configuring Application Security.